Now in paperback, from the author of the bestselling The Middlesteins: the novel that's "unabashedly emotional, refreshingly devoid of New York City cynicism, and tenderly funny?" (People). Jarvis Miller's artist husband has been in a coma for six years. And so, Jarvis has spent these years suspended between hope and grief, paralyzed with longing for a life and a marriage that are slipping away. But then, unexpectedly, Jarvis makes her first new friends in years when she meets the Kept Man Club: three men whose lifestyles are funded by their successful wives, who gather once a week on laundry day. With their help, she reawakens to the city beyond her Brooklyn apartment, past the pitying eyes of her husband?s art dealer and his irresponsible best friend as her future begins to take on the irresistible tingles of possibility for the first time in almost a decade. When a shocking discovery casts a different light on her idealized marriage, she's propelled even further down a path that she would never have dared to imagine just months before. 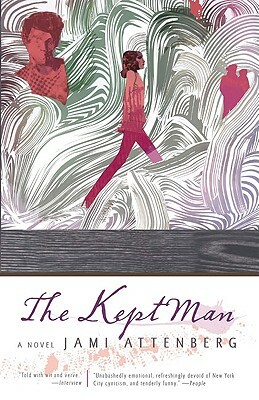 Tender, bold, and unabashed, The Kept Man is a compulsively readable novel about love and loss from one of our most dynamic new storytellers. Jami Attenberg is the author of the novels The Middlesteins and The Kept Man and of the story collection Instant Love. She has written for The New York Times, New York, Salon, Nylon, Print, Nerve, and others. Chicago native, she lives in Brooklyn, New York.